Eight years ago, Dassault began to apply its technology to non-industrial projects, starting with a 3D model showing how the Great Pyramid in Giza, Egypt, was built. Last year, it ventured into dance, coming up with what Tayoubi calls a “magic box” for choreography to inhabit. Grey screens form the “walls” of the stage and, along with the floor, provide a 3D surface over which a range of virtual imagery can play, courtesy of six projectors. Some of this imagery takes the place of a conventional stage set. But, just as in a computer game, the action can be located in – or swiftly relocated to – whatever world the choreographer desires. Like a game, too, things are never static: a rush-hour crowd tramping through the city becomes a virtual corps de ballet; a snowy landscape comes lyrically to life as subtle shifts of light create the effect of passing clouds and shining sun. Even more sophisticated are the motion-capture sensors that track the performers, so that they appear to interact with the imagery as they dance. It’s all digital smoke and mirrors, but the impact is strikingly physical: the thrill of dancers kicking up clouds of autumn leaves as they pirouette; the feeling of entrapment when they seem locked in an Escher-like grid of juddering geometric patterns. Of course, virtual imagery isn’t new to the stage. It has been used in theatre: in David Mitchell’s immersive 3D opera Sunken Garden at the Barbican earlier this year, for example. And Merce Cunningham used the technology to magisterial effect in Biped, a 1999 work that used moving bars of light to bend the perspectives of the stage, while shadowing its live dancers with digital avatars; some of these were giant figures who strode across the space, some mere feathery trails of movement, like the muscle memories of the dancers inscribed in light. 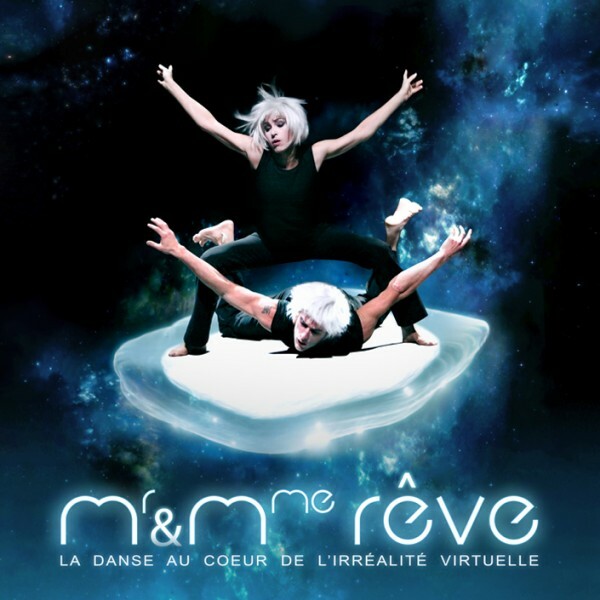 In certain ways, M and Mme Rêve is less satisfying than a work like Biped. The choreography is much less sophisticated: more a succession of slickly animated scenes than a coherently imagined whole. And, despite the amazing range and ambition of its many forms of imaging, some of the processes are clearly still at developmental stage. The motion-capture sensors have a limited range for both speed and distance, forcing the choreography to stick to specific areas of the stage. Moreover, as ingenious as graphic artist Gael Perrin has been in translating Ionesco’s world into digital form, some of his images lack the painterly richness that we’re used to seeing in the more traditional dance designs of, say, Nicholas Georgiadis, who created sets and costumes for most of Kenneth MacMillan‘s ballets. But there is still dizzying potential for dance here, even if the main attraction for Dassault has been the chance to present its technicians with new challenges. If the benefits are clear to Dassault, they’ve been a revelation for Le Théâtre du Corps. The work is easy to tour: the only objects that have to be transported are the three screens (which can be made to fit the dimensions of different stages) and the software apparently needs no special technicians to operate it. This first experiment was, however, expensive; and that performance I saw in Paris last week was the result of months of fiddling around in a “3D experience lab”. Still, the simplicity of having just one piece of technology that can conjure up whole worlds of scenery, lighting and sound means the magic box could allow shows of a more modest scale to punch well above their weight. Equally, the concept could be vamped up into something immense. Watching M and Mme Rêve, I could imagine this approach being used to recreate one of the great court ballets staged by Louix XIV way back in the mid-17th century not too far from Paris. Back then, only a king could afford all the ingenious machinery and lavish designs such extravaganzas required. Today, all Louis would need is a 3D experience lab.